The Sumerians are some of the first known people in recorded existence. The earliest known reference to the ancient Sumerians comes from ancient cuneiform tablets. They formed a flourishing and remarkably advanced society throughout Mesopotamia, particularly southern Mesopotamia (Iraq), which was known as the land of Shumer, or Sumer. They remain somewhat shrouded in mystery, as their linguistic and ethnic origins are not well known. Sumerian civilization is proven to have flourished from before 3500 B.C.E. 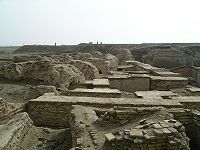 In the temples of E-Anna in Uruk (Erech), pictographic tablets were discovered, indicating man's first efforts at writing. These tablets were dated from the fourth millennium Uruk period, which dates from 3500-3100 B.C.E. By the middle of the third millennium, the ancient Sumerians had fine tuned their writing system, and called it "cuneiform". The Sumerians proved to be extremely industrious and intelligent. They invented the wheel, schools, hospitals, irrigation, and other fundamental elements of society. They were highly advanced astronomers, and possessed a very complex pantheon. The Sumerians were the first true empire recorded on earth, and built a highly advanced and prosperous civilization. 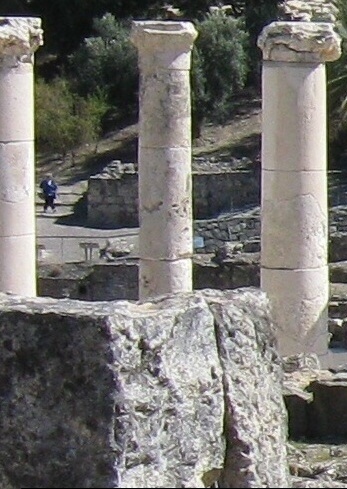 Their civilization was based on the city-state - where a single city was ruled by a local king - assigned to rule by the gods, or particular god of that city. During the Third Dynasty of Ur, a great city of ancient Sumeria, documents were uncovered from the reign of Shulgi of Ur, loosely dated from around 2150 - 2000 B.C.E. In these documents, the two character cuneiform characters SA.GAZ appeared. The two characters have no meaning apart from each other, which is very unusual in cuneiform, as most logograms have individual meaning as well. It translates to the Akkadian word, "Habbatu", or, "brigand", and "highway robber". It was during this period which an influx of Western Semitic speaking people arrived in Mesopotamia . Among these people were the Akkadians, and the Amurru, or Amorites - all from the western desert and beyond. These people were basically immigrants. Their status among governing authorities was uncertain, as they represented a new social element within ancient Sumerian culture. Simultaneous with the arrival of new people are the appellations SA.GAZ, Habiru, and Habiri, appearing in ancient Sumerian literature. "an unclothed people, who travel in dead silence, who destroy everything, whose menfold go where they will - they establish their tents and their camps - they spend their time in the countryside without observing the decrees of my king." Another ancient Sumerian document deals with SA.GAZ in a legal arena. "Nannakiag, son of Lugasladda, said to the ensi: 'Anzika, the SA.GAZ, is not my man.' Ur-Mami was sent with him as supervisor. Nannakiag cleared the man with regard to what he said. He did not confirm him regarding SA.GAZ (activity)." It would seem a certain Anzika, who happened to be SA.GAZ, was accused on that basis alone due to some recent wrong doing by other SA.GAZ men. Nannakiag clears Anzika, saying he is not the SA.GAZ man guilty of other SA.GAZ actions. Thus, the SA.GAZ exact legal status seems to be uncertain. This idea is reinforced in other documents. 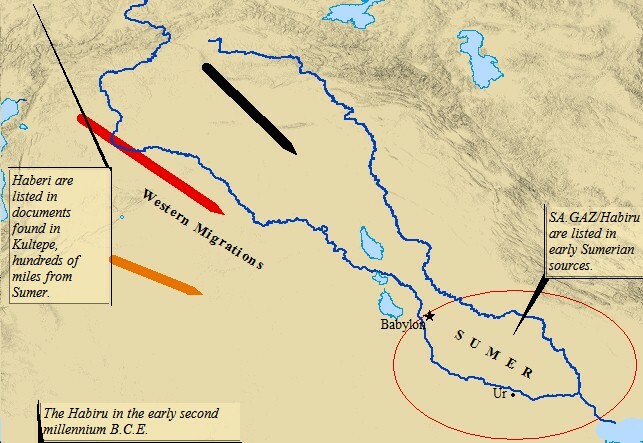 A map of the migration of the Habiru into ancient Sumeria. "Ku-u, Dada-u-numun, Nur-ili, and Zulala were judges. The SA.GAZ sued but was unable to substantiate his case." "If a man rented a boat, and he set it on a journey, for him, the owner, and its journey...he altered, and the...of the...boat was employed for SA.GAZ activity, the man who rented the boat, the boat he shall restore." Ancient Sumerian documents show these people were employed in various jobs. One document recorded sheep and cattle being given to SA.GAZ for unspecified government service. As would prove to be the case in later documents, livestock was often presented as a form of payment to these people. Another document reveals that the SA.GAZ were active in the Sumerian military. "Four suits of clothing for the sergeants of the Habiri (were) received by Ibni-Adad...out of the midst of the treasury of Bit-Shamahh from the hand of Ili-ippalsa. Month of Nisanu, 11th day, year Rim-Sin became king." 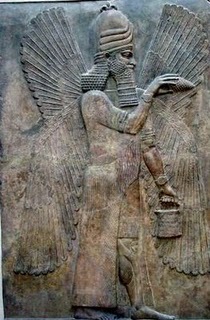 It is clear from this illustration that the Habiri received clothing for their role in the ancient Sumerian military. Thus, in their earliest references they are attached to the military as a mercenary-like unit. They are identified as being separate, but at the same time under the employ of the nation's military. This is clear evidence of the Habiri acting as mercenaries in as early as perhaps 2150 B.C.E. It would appear from these references that the SA.GAZ, though a new social element towards the end of the 3rd millennium B.C.E., functioned in a variety of roles in ancient Sumeria. This is the earliest references to this group of people. The Habiru were active in government service, the military, the business world, and also dwelt on the outskirts of civilization. The royal tombs of Ur date back to the middle of the third millennium BCE - four to five centuries BEFORE Abraham in Ur. The Royal Tombs of Ur date four to five hundred years before Abraham and Terah, during the Early Dynastic Period. Abraham lived in Ur ca. 2000 BC - around the time of the Third Dynasty of Ur. It was from Ur Abraham left and answered God's call, traveling along the Euphrates to Haran, in northern Mesopotamia. From Haran Abraham departed for Canaan - the Promised Land. At the same time, they possessed an air of mystery and uncertainty. Their legal status appeared undefined. References to their nature and character varied widely, from mercenaries, to an "unclothed people". There appears no cohesive element which binds these people, other than their social status as being separate from the native population. One element absent from these earliest references are any references to a shared ethnicity. These were a heterogeneous mixture of people, from different countries, religions, and cultures. Presumably, these were the results of the weaker tribal elements that had been cast out from their homelands, and in their wandering joined together with individuals sharing a similar fate and circumstance in life. As they splintered off, being forced into exile, they joined up with other similar people, and formed new bands. These bands migrated away from their homelands, eastward across the desert towards Sumer. They were in search of a new home. Later, after the Sumerian Empire, the Akkadians adopted the exact Sumerian logogram to refer to a strange and separate people. This logogram was found littered in the Amarna tablets. Strangely enough, the Sumeria root of SA.GAZ indicates violent and criminal behavior. Even more, SA.GAZ is an appellation typically used to illustrate the perpetrator of such violent and criminal acts. Certain of these men were violent mercenaries, criminals and outlaws. The reference to an "unclothed people...who destroys everything" confirms this, as well as the association with the military. Parts of these groups were dangerous, as is the case with any large refugee exile or migration. Violence is a natural byproduct. Yet, to the extent of their guilt in preemptive violence, such conclusions cannot be drawn from these earliest Sumerian records. These people appear as refugees and wanderers - not invading hordes. However, preemptive violence is certainly evident with the Habiru in the Amarna tablets, where they are depicted razing Canaanite cities to the ground in a mass invasion. The Habiru appear to be an aloof social entity for much of the Bronze Age. It is important to emphasize "SOCIAL", as being their primary bond. These bands were not ethnic groups, but may have included ethnic groups. 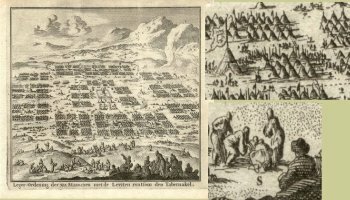 The tribes of Israel encamp in the wilderness under Moses during the Exodus. They were heterogeneous mixtures of people forming social bands, or tribes, and performing a variety of different tasks within their new homes. Interestingly enough, this is exactly how the Bible depicts the Israelites as they wandered out of Egypt under Moses. The group that left was not wholly Israelite in makeup. Though most certainly the Israelites did leave Egypt under Moses, in Exodus 12:38 we learn an interesting fact. "A mixed multitude also went up with them, along with flocks and herds, a very large number of livestock." People not of Israelite birth, blood and belief traveled with them out of Egypt. In this respect, the wandering Israelites were indeed a mixed band of Habiru, wandering and displaced individuals. They, too, would become an invading force in Canaan, launching multiple attacks simultaneously while conquering and resettling many cities. Both groups also have ancient Sumerian connections as well. Many fascinating and tantalizing parallels exist between the Hebrews and the Habiru, and yet the debate rages on. SHARE YOUR THOUGHTS ON ANCIENT SUMERIA & THE HABIRU Are you a student of the ancient Sumerians? What are your theories as to the Habiru? Click on the above link to give us your insights, thoughts, comments, and questions! Ancient Hebrews and Babylonians, and established an advanced empire stretching from the fifth to the second millenniums B.C. 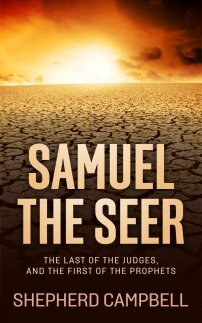 Samuel Noah Kramer has compiled the most complete and thorough book on the Sumerians, entitled, The Sumerians: Their History, Culture, and Character. Kramer's book provides the layman with a unique and insightful glimpse into the ancient Sumerian world! Click on the link below to re-direct to Amazon.com. 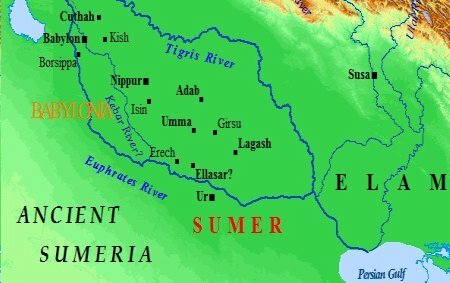 A map of ancient Sumeria and the empires of southern Mesopotamia.